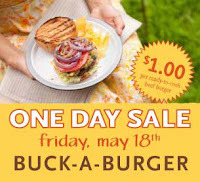 Tomorrow, Friday, May 18th, Whole Foods Market is having a Buck-A-Burger One Day Sale. Ready-to-cook beef burgers will be priced at $1 each! Per their blog, they will be at least 1/4 pound burgers, but they don't give many other specifics as it may vary by store.